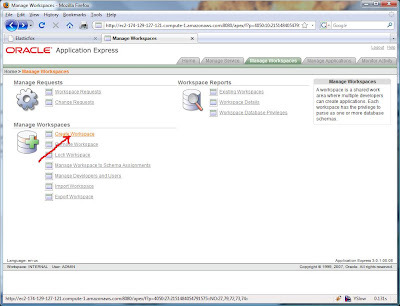 The Application Express 4.0 evaluation instance is running on an Amazon EC2 instance. 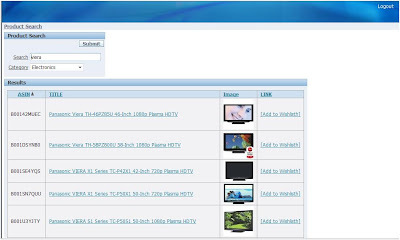 You can access it at http://tryapexnow.com. You may also be interested in checking out the APEX 4.0 Web Services Evaluation Guide here. Tyler recently made me aware of http://samplecode.oracle.com/. It is a great place to share code projects, allow others to contribute and comment through discussion forums. I have set up a project for the flex_ws_api and all further development will take place there. I have created discussions for general questions, bug reports, and enhancement requests. Feel free to participate there. All you need is an OTN account to login. I have been working on an Application Express 4.0 feature to support consuming REST Web services. REST Web services use a simpler architecture than the popular SOAP style Web services. Instead of posting some big XML document wrapped in a SOAP Envelope, REST requests are typically done by passing name/value pairs in the query string of a URL. To prove that the support for REST I am building in Application Express is useful, I have been working with popular public REST Web services offered by Yahoo, Google and Amazon. I built a similar application to the Amazon Store sample application using the REST APIs. Everything was going great until I received the following email from Amazon. We wanted to remind you that all Product Advertising API developers will be required to authenticate all calls to the Product Advertising API by August 15, 2009. We noticed that requests with your AWS Access Key ID are not being signed and, while you have more than 60 days until the date on which authentication is required, we are, as a courtesy, sending you this email to remind you of the new authentication requirement. Please remember that calls to the Product Advertising API that are not signed will not be processed after August 15, 2009." What do they mean I need to sign my requests? Luckily they provided some links for developer resources on how to construct signed requests. In a nutshell, you must byte order all of your parameters, add a Timestamp parameter and then you create a base64-encoded HMAC_SHA256 signature using your AWS secret key. Should not be a problem. I recently added support for parameters in REST requests to be populated by the result of a function and I am somewhat familiar with the DBMS_CRYPTO package. Unfortunately I quickly found out that DBMS_CYRPTO only supports HMAC_SHA1 and I not so quickly found out that HMAC_SHA1 is not the same as HMAC_SHA256. Am I stuck? I binged (Google gets enough love and Microsoft can use the help after their most recent earnings results) for HMAC_SHA256 and PL/SQL and found this forum post. This guy wanted to do exactly what I need to do. Someone suggested that he create a Java stored procedure and then he responded with some Java code example with and hmacSHA256 function. Unfortunately no-one could give him an example of exactly how to create that Java stored procedure and then use it in PL/SQL. That's when I remembered that my good friend and colleague Joel Kallman wrote about creating a Java stored procedure to create a zip file of BLOB's. First, start by compiling the following Java source. // Start by getting an object to generate SHA-256 hashes with. // Hash the key if necessary to make it fit in a block (see RFC 2104). // Pad the key bytes to a block (see RFC 2104). // SHA-256(KEY ^ IPAD + MESSAGE)), where IPAD is 64 bytes of 0x36. // SHA-256(KEY ^ OPAD + INNER_HASH), where OPAD is 64 bytes of 0x5c. // convert its bytes to hexadecimals. // Return a hexadecimal string representation of the message signature. Next you create a standard PL/SQL function that uses the java source as in the following code listing. Finally, you create a function that takes in the string to sign, your AWS Secret Key, and then creates the HMAC_SHA256 signature. The only difference in the result is the very end. Prior to using the signature, it must be URL encoded. If you run the string uMJX4cN6EXHyTUrC03Ae9hAcGdTnAHI0KqtovwQUHP8= through wwv_flow_utilities.url_encode2, you will get uMJX4cN6EXHyTUrC03Ae9hAcGdTnAHI0KqtovwQUHP8%3D. Late last year I promised a white paper and sample application on integrating Application Express and BI Publisher through Web services. 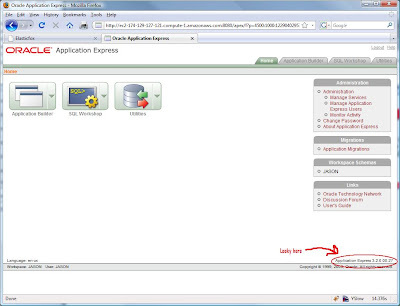 Well five months later (hey, that's less than 1/2 a year), it is now available on the Application Express Web Services Integration page on OTN. 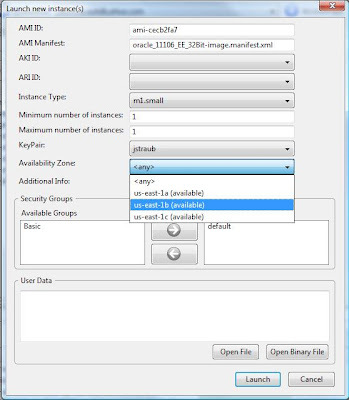 The sample application allows you to login to a BI Publisher instance as a BI Publisher defined user, browse the folders and reports available to that user, and provides the ability to download the report all from within the Application Express application. The white paper describes in detail how to build the application using PL/SQL and the flex_ws_api package. I hope you find it useful. I didn't want to have to start from scratch; I wanted to keep the database and all the applications that I installed intact. But how could I do that? I knew full well that once I shut my instance down everything was gone. This is where the beauty of Amazon's Elastic Block Storage (EBS) comes in. It allows you to create persistent volumes that you can then attach, format, and mount on an EC2 instance. If you shutdown the EC2 instance for any reason your EBS volume persists and you can then mount it on another EC2 instance. EBS has its own charges and I estimated it would cost me about $18 per month for my 10GB volume. But I am saving about $72 month by decreasing my hourly costs by 10 cents, so my net savings will be more than $50 a month. Not bad. So the idea is that I create an EBS volume, move all the database files necessary to run the database to that volume, and then start a database using those data files on the cheaper machine. With some help from my friends at the Oracle Cloud Computing Center, I was able to do just that and I have detailed the steps below. First I needed to create my EBS volume. This is very simple using Elasticfox and detailed in the Elasticfox Getting Started Guide. 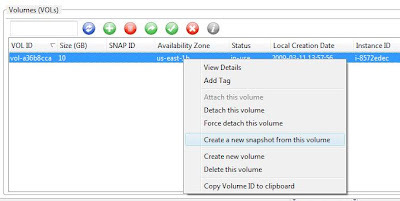 Click on the Volumes and Snapshots tab and then the create icon. 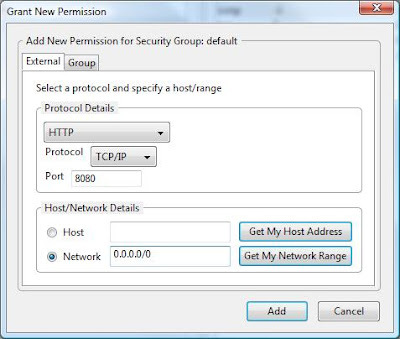 Enter the size in GB (I chose 10) and also choose an availability zone. This is important since you can only attach EBS volumes in the same availability zone as your EC2 instance. My instance was in the us-east-1b zone so I chose that. 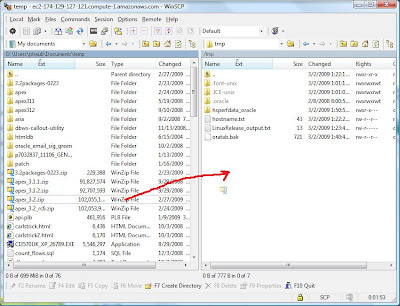 My instance had a mount point of /u02 which contained all of the file necessary for my database including the datafiles, control files, redo log files, etc. I copied all those files to the temporary mount point on /mnt. First I shutdown the database or the files will be unusable. Finally I un-mounted the current /u02 mount point and remount /dev/sdf1 to /u02. I only did this to prove I can start the database using the EBS volume with these data files. If I can't start the database using this EBS volume mounted as /u02, I don't want to proceed until I can. In my case, the database started up so I did a shutdown immediate. I un-mounted /dev/sdf1 and then detached the EBS volume from this instance. I kept this instance available until I successfully started the database on the new smaller instance. With the database shutdown and the EBS volume detached, I created a snapshot of the volume. The snapshot is a point-in-time backup of the EBS volume and it is stored using Amazon's S3. Once I have a snapshot, I can create new EBS volumes based on that snapshot. This gives me the flexibility of shutting down all instances and deleting my EBS volume, and then I only pay S3 storage charges. I can create a new EBS volume based on this snapshot sometime in the future, start an EC2 instance, attach the EBS volume and I am good to go. Next, I started a new instance using the same 11gR1 32 bit AMI on a smaller instance with Elasticfox. It was important that I chose the same availability zone as my EBS volume, us-east-1b. I connected to the instance using Putty and chose "No" when asked if I wanted to create a database at this time. This gave me an instance with the Oracle software installed in an Oracle home, but without a database. Now for the magic. I created a /u02 mount point under /, attached the EBS volume to this instance as /dev/sdf1, and then mounted it to /u02. To start the database on this instance I also needed to set my ORACLE_SID environment variable and create symlinks in $ORACLE_HOME/dbs to the spfile and password file in the admin directory on /u02. And my database started on the new 10 cent/hour machine! I know that I am horribly overdue for a post. I was out at the RMOUG Training Days last week and presented on Integrating Web Services and Application Express. The presentation should be linked from the referenced page soon. Unfortunately I only had 60 minutes to present 90 minutes worth of material. I presented on integrating Web services created from JDeveloper, XDB Native Web Services, BPEL Web services and finally integration with Oracle Content Server (formerly Stellent). The presentation was supposed to end with a discussion of debugging techniques using a variety of tools such as SOAPUI, ProxyTrace and XMLSpy. Luckily, I will be presenting at the ODTUG Kaleidoscope 2009 in Monterey California in June. I have 90 minutes so I will be able to get to the debugging topics. Please join me if you can swing it. Lastly, I have made a couple of minor tweeks to flex_ws_api. The changes allow for a more graceful response from parse_xml and parse_xml_clob if the node is not found using the supplied Xpath expression. It now simply returns null.